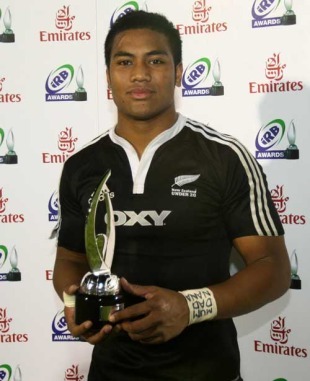 New Zealand wing Julian Savea has been named the IRB Junior Player of the Year 2010. Savea was presented with the Award by IRB Vice Chairman Bill Beaumont after helping New Zealand win a third successive IRB Junior World Championship title with a 62-17 defeat of Australia at the Estadio El Coloso del Parque in Rosario, Argentina. He becomes the third New Zealander in succession to win the coveted award, following in the footsteps of Aaron Cruden in 2009 and Luke Braid in 2008. Savea beat off stiff competition from his New Zealand captain Tyler Bleyendaal, Australia centre Robbie Coleman and Argentina fly-half Ignacio Rodriguez Muedra to receive the honour. The 19-year-old powerful and athletic wing scored eight memorable tries in the latest staging of the Under-20s tournament to equal the record of countryman Zac Guildford set last year in Japan. Savea has been almost impossible to stop when in full flight, leaving defenders in his wake. Coming to the Junior World Championship with experience of the IRB Sevens World Series, Savea has shown great spatial awareness coupled with speed and strength. Savea is the latest New Zealander to win the IRB Age Grade Award with previous winners Cruden, Isaia Toeava, Jerome Kaino and Luke McAlister all having gone on to play for the All Blacks. "The IRB Junior World Championship has shown us the future stars of the world game, which looks to be in very good hands," said Beaumont, in Argentina to present the Award. "The IRB Junior Player of the Year Award is essential in recognising achievement at this level and Julian should feel extremely proud that he has won this award given the very talented players on show here over the past three weeks."